Craggy black stone towers loomed over the black sand and stone beach. A silky mist floated between the structures silhouetted ethereally from the sun. They seemed close, but with each step, our feet sunk uncomfortably into the smooth stones. My muscles clenched as I released my foot from the stony grip. It’s as if someone, or something, didn’t want us to continue forward. We could’ve stopped and just gone back to the car, but I was drawn to the towers. My friend Jill and I pressed on, wanting to see behind and in between and around the stacks the guidebook says is the site of an Icelandic elf church. Our husbands, Dave and Cory, reluctantly joined us on the deceivingly laborious trek across the Djúpalón Beach. Jill and I were determined to experience the Icelandic folklore that was as much a part of our guidebook as Icelandic history. Before we booked our trip to Iceland, I remembered reading an article a few years back, long before the country topped my “I want to go to there” list, about how road construction was diverted to ensure the elves in that particular region weren’t disturbed. So, when we did finally book our six-day trip, the huldufólk, or hidden people, became one of the first features of Iceland I wanted to learn more about. From the article and hearsay, I gathered that most Icelanders believed in them to some degree or another. Although the guidebook gently deters travelers from asking any Icelander about the elves, I was curious nonetheless. And after an unsuccessful (albeit half-hearted) attempt to convince my traveling party to take a huldufólk tour in Hafnarfjörđur, a town just outside of Reykjavik that seemed to be the center of elf lore (and, I believe, the site of the road construction/elf interference controversy), I was determined to look for signs of them on our self-guided tour of a tiny sliver of the country. From the moment we landed, I realized that one need not travel far to see why the Icelandic landscape is ripe for fairy tales. Minutes from the Keflavik airport as we drove toward the capital, Reykjavik, we passed through knobby fields of dried and towering lava topped with light green moss. And indeed there was not a tree in sight, just a lunar landscape of centuries-old lava that conjures up recent memories of the Eyjafjallajökull Volcano eruption back in 2010 that re-routed many European flight patterns for weeks. This lava may have been dry for many years, but it could very well be recent. It’s no wonder an environment so volatile could create belief in wrathful trolls hiding within the lava fields and mountains. A couple hours after leaving Reykjavik — after passing under and over impossibly blue and presumably ice cold fjords with a consistent view of silky snow-topped mountains — we passed through yet another lava field. This one on the Snaefellsnes Peninsula seemed even wilder with the mountains in near spitting distance. “This lava field has something to do with the Berserkers,” Jill said, having studied up on the bits of folklore presented in the guidebook. The “Berserkers” were hardy, yet violent, workers from Scandinavia that were often employed as hired heavies during Viking times. Because of their stature, they were often employed by farm owners to help with manual labor. “Apparently two Berserkers were killed and buried in this lava field,” Jill said. She went on to read the Eyrbyggja Saga as told through the guidebook about the two men brought over from Norway to work for a prominent local farmer in the 10th century. One of the Berserkers fell in love with the farmer’s daughter. Thinking this might be his way of getting rid of them, the farmer, based on council from the local chieftain, proposed what he thought an impossible task: they must clear a path through the lava field to his brother’s homestead and, as repayment, the hefty Norwegian could marry his daughter. But to the farmer’s horror, the Berserkers succeeded. Panicked that he’d have to follow through with his promise, the farmer and his brother killed the men by trapping them in a sauna and buried the Berserkers in the lava field. This Viking Saga is what gave the field its name today, Berserkjahraun. The story could have very well happened as the graves of two large men were found at the site. The realistic nature of the story (much like many of the Icelandic Sagas) uses the landscape as part of the story. It’s of that landscape that the tales of magic realism — of elves, trolls, witches and ghosts — arise as well. The sagas and the fantastical legends blend together in lore that brings the otherworldly Icelandic landscape to life as you travel through it. As we traveled, I can imagine that the people in the early settlement ages before the 9th century when the harsh, mostly dark winters were driven indoors to spin tales of the people and beings of the past. Perhaps they were making sense of the precariousness of the nature around them. When you had hidden hot pools and active volcanoes and heavenly green lights illuminating the night skies, why wouldn’t there be hidden people in the lava fields moving your things just to bother you? Why wouldn’t a witch lure you into unmarked territory to become lost? Why wouldn’t an angry troll cause a massive volcanic eruption? Solveig, a glamorous woman from Iceland’s second-largest city, Akureyri, told me as we chatted on our flight back to the U.S. that she was taught to think of the elves as she grew up. Before I met Solveig, I was already seeing how the peculiarity of nature had an impact. While I still didn’t believe that elves or trolls existed, I was starting to see how Icelanders past and present might. The next morning, after the weariness of a long day’s travel wore off and we woke up to a resplendent sky illuminating the fjord view from our cabin at the base of the distinctly ridged Mt. Kirkjufell — supposedly the most photographed mountain in Iceland — it became clear that the mystery of the landscape was equal to the beauty. Sitting with my cup of coffee overlooking the valley below, in the 35-degree chill and springtime Arctic sun warming my face, I felt like I was in a magical fairy tale. The glacier-topped mountain just across the road reflected flawlessly in the still, mirror-like fjord below it. White dots circled the cliffs above where the seabirds flocked. I was breathless and, even though I was still at the beginning of the trip, I didn’t want it to end. The Icelandic springtime sun moves slowly in the sky. So even though we never made it out of the cabin for our day’s adventures until 11:00 a.m., there was little risk of getting home past sunset as light lingered in the sky until around 10:00 p.m. in the April evening. We spent that first day taking photos of Mt. Kirkjufell from a waterfall nearby and hiking along the shores of a fjord close to the small town of Grundarfjörður. Every few hundred feet, I couldn’t help exclaiming, “This place is amazing!” to my companions. Feeling the same way, they didn’t seem annoyed by my constant proclamations. I didn’t think it could get any better when we opened up the still-cold cans of the local Gull beer we had purchased in Duty Free the day before (a recommendation from experienced Iceland travelers that we heeded wholeheartedly understanding that rural Icelandic liquor stores had inconvenient and funky schedules). But I thought too soon because two hours later, we were soaking in the public hot spring in the Snaefellsnes Peninsula’s largest town (yet still less than 1,200 inhabitants), Stykkisholmur. These public hot springs are found in towns all over the country. The popular Blue Lagoon near Reykjavik gets all the attention, but these public pools are a part of Icelanders’ daily lives. While most of these hot springs (called “hot pots” locally) are now made into regular-looking pools in YMCA community center-style settings, they make me think back to the pre-concrete structure days. What would you think as a 6th century farmer making a living in the harsh and isolated Icelandic landscape and then coming upon a mysteriously hot, bubbly, natural pool of water? You can warm your house and save some of the scarce wood for cooking. But where did it come from? The only logistical explanation could be magic, right? Millions of sparkling green specks arranged in undulating waves floated seemingly directly above our cabin. For the weeks leading up to our trip, I prepared myself not to expect seeing the Northern Lights because of the cloudy forecast. But there we stood, underneath an incredibly vast sky watching green waves move ethereally through the dark heavens. 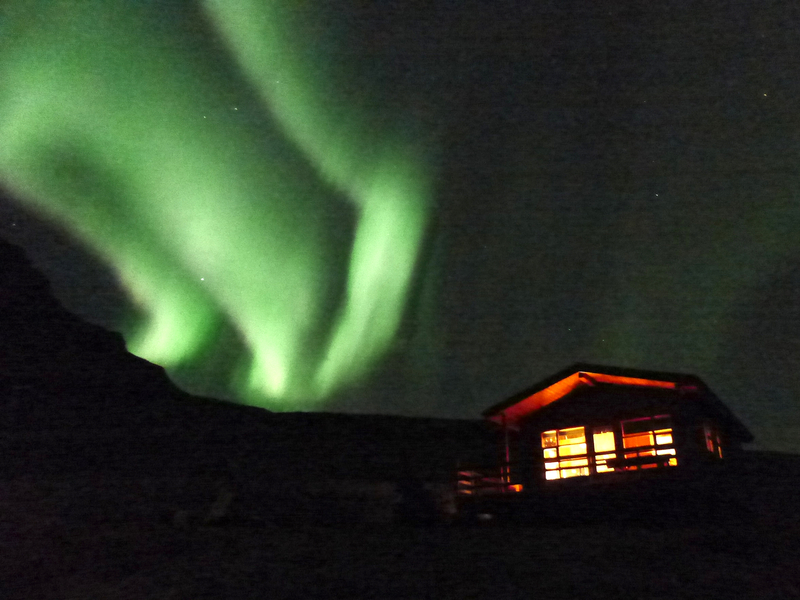 While, yes, there is a scientific explanation for the aurora borealis phenomenon, standing there in that moment in awe with my husband and close friends, I had a hard time not believing in the magic of it all. The next day it was that sense of magic that carried me across that rocky Djúpalón Beach. With each arduous step I focused on the dark stone pillars that looked as if they were shaped by ancient human hands. 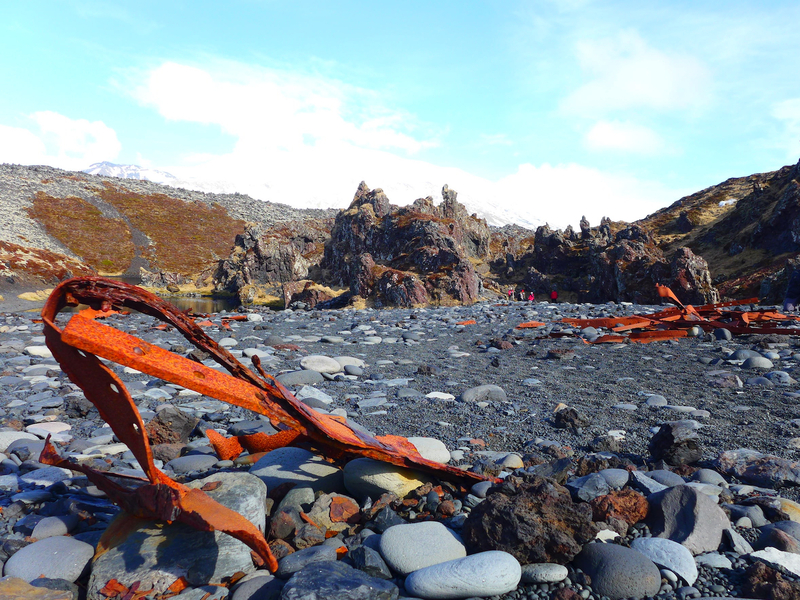 The mystery of the scene doubled as we passed the twisted, bright orange, rusty remains of a shipwreck that scattered the waterfront. Could the magical forces behind those pillars been related to that shipwreck? Finally, we reached the pillars and to avoid the suction-like pull from the stones, I hopped along the base of the craggy pillars. The sun shone bright along the dark rocks making us sweat even more after the workout walk across the pebbles. Yet I still took a moment to sit in a carved-out pocket to gaze out at the sea. Those pillars were likely created from the consistent pounding of harsh ocean tides. But in a place where the natural wonders transcended my expectations of reality, I could picture elves gathering at this spot to worship their god or gods. Mist from the pounding waves enveloped them in a low-hanging cloud as they chanted rhythmically as the light whoosh and thump of the waves provided a natural drumbeat. Elves could totally exist. 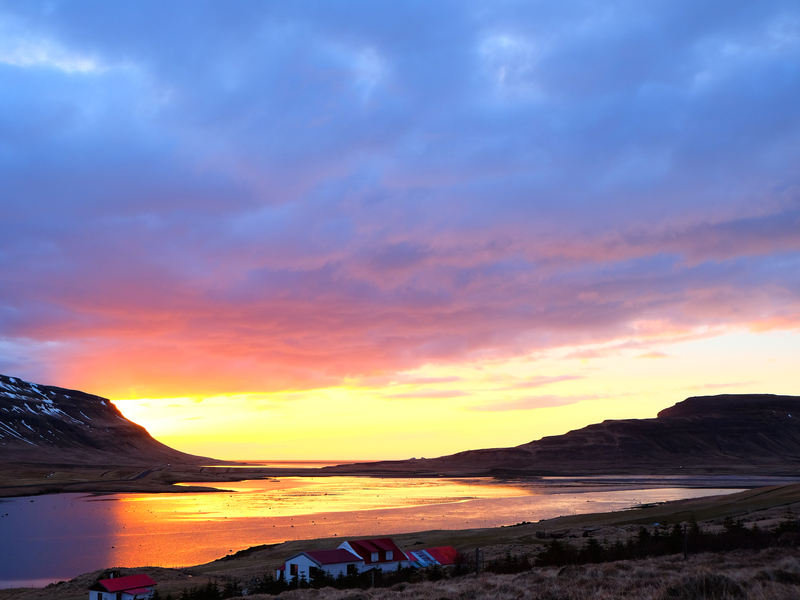 Not just back when this land was new to the pioneering settlers, but to modern Iceland. Iceland’s sparse landscape that teams with life under the surface is ripe for magic old and new. It’s that magic that draws me back. Elizabeth Doerr is a Portland-based freelance writer and social justice educator. She’s spent most of her adult life looking for the next place to live or travel. You can learn more about her and read her other work at ElizabethDoerr.com.